“Love is staying up all night with a sick child --....Robert Frost. Now imagine staying up night after night worrying about your child who has been diagnosed with cancer. Would you not do ANYTHING for your child? I have been touched by one of my good friend's little girl. Her name is Mia and, thankfully, she does not have cancer, but she wants to celebrate her birthday by helping other children who are suffering from cancer. Mia believes all kids should have happy and healthy birthdays. It started the night Mia's Aunt, a registered nurse at Fox Chase Cancer Center, stopped by to visit. This was the first time Mia had seen her Aunt since she cut off her long, black hair to donate to Locks of Love. Mia's Mom and Aunt explained to her that some kids get very sick with a disease called cancer and can lose their hair while they are trying to get better. Mia decided immediately that she wanted to get her hair cut and donate it too. 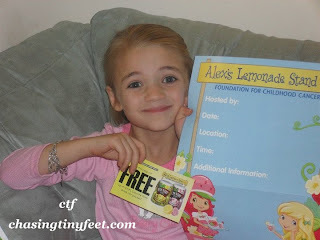 They explained to her that she didn't have hair long enough to donate, but they had recently received an email from Alex's Lemonade Stand Foundation and they could look at it for ideas on what she could do to help. 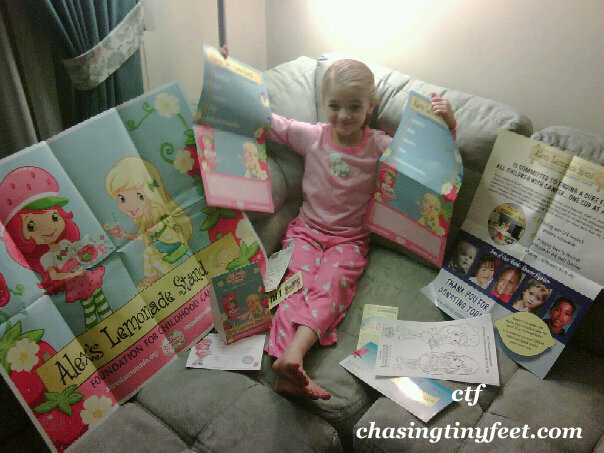 As soon as Mia saw the Strawberry Shortcake logo in the newsletter and they read more about it, she got the idea to have a Strawberry Lemonade Stand on her 6th birthday - September 28th. Her goal was small, just $60.00. Amazingly, Mia was already a quarter of the way to her goal twelve hours after her Mom posted information on her fundraising page on Facebook! On September 28th, Mia gets home from school at 4 p.m. and she will have her lemonade stand up and running- complete with lots of pink and yellow balloons for a happy birthday atmosphere. Please help Mia celebrate her birthday by helping her with her fundraising efforts. Donations can be made through Mia's fundraising page on Facebook. 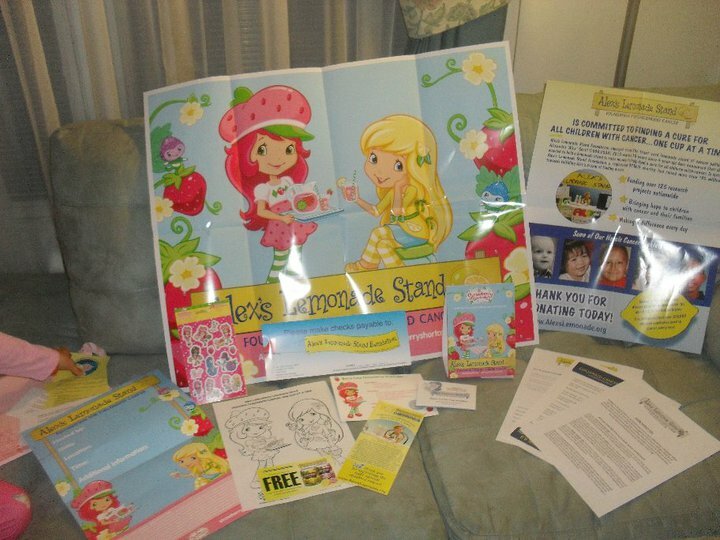 Alex's Lemonade Stand Foundation and Strawberry Shortcake are enlisting supporters from across the country to host a special Strawberry Shortcake Alex's Lemonade Stands to commemorate National Childhood Cancer Awareness Month throughout September. 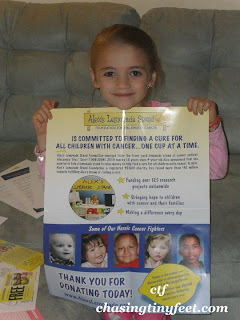 Alex's Lemonade Stand Foundation (ALSF) emerged from the front yard lemonade stand of cancer patient Alexandra "Alex" Scott (1996-2004). 2010 marks 10 years since 4-year-old Alex announced she wanted to hold a lemonade stand to raise money to help find a cure for all children with cancer. Since Alex held the first stand, the Foundation bearing her name has evolved into a national fundraising movement, complete with thousands of volunteers across the country carrying on her legacy of hope. To date, ALSF has raised more than $3 million towards fulfilling Alex's dream of finding a cure, funding over 125 research projects nationally. You can also register to hold a strawberry lemonade stand during September which is Childhood Cancer Awareness Month. Strawberry Shortcake will donate $50 to ALSF for each registration! 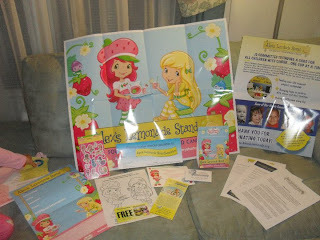 Click here to learn more and to register: www.AlexsLemonade.org/campaign/strawberry-shortcake . Other upcoming events for ASLF! Mickey Mouse Clubhouse is a great show for toddlers and pre-schoolers. I was very excited to learn that a new DVD, Mickey Mouse Clubhouse: Road Rally, is going to be released today, September 7, 2010. I was fortunate enough to get a sneak peak of the new release! Right off, the DVD cover is adorable! Checking out the back, I realized that this DVD has three ways to watch and play this full length feature. First, there is Discovery Mode for ages 2-3. In this mode, as you watch the movie, you can use your remote to answer questions about colors, shapes, and sizes. The next mode, Discovery Mode 2, is for ages 4-5. In this mode, you move to a higher mode with more challenging questions to answer. The third mode is Fast Play. This mode lets you watch the movie without having to use your remote. This is the mode I watched the movie in with Mason. The first episode, Mickey Mouse Clubhouse: Road Rally, is an adventure in which the Mickey Mouse Clubhouse gang participates. They must travel through Mickey Park, a sandy desert, Mistletoe Mountain, a tropical jungle, and then back to the Clubhouse, all while finding hidden “Mickey Markers” along the way! Once thy have found all the markers, they may head back to the Clubhouse. There are challenges along the way of course! The gang must pull together to help each other overcome obstacles like a pile of rubber duckies, a sand covered road, and a broken down bridge. Oh, Toodles is also along for the Rally to help the gang out. The next episode on the DVD is Mickey Mouse Clubhouse: Pluto Lends a Paw. This episode is just as fun to watch as the rest of them! Pluto, the rescue dog, is enlisted to help Minnie find her kitten, Figaro. Along the way the gang runs into Donald at the golf course, Daisey painting a picture, and Goofy who is also looking for his lost kitten, Mr. Pettibones. And, as usual, Mickey and his friends use their Mouseketools to help solve their problems. Mickey Mouse Clubhouse is a wonderful and educational show because of the learning that is inherent in program. Mickey Mouse Clubhouse encourages teamwork, early mathematical skills and problem solving skills. Children are involved socially with the characters and there is also positive reinforcement for your child though cheers from the characters. You will also find that your youngster has to count, complete patterns, find shapes, and colors. I would recommend Mickey Mouse Clubhouse: Road Rally to any parent who is looking for, not only entertaining, but educational programming for their child. Disney provided me with the product reviewed above in order to facilitate this review. All opinions are 100% mine.